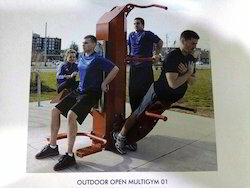 Function: Strengthen the strength and the flexibility of the abdominal muscles and back muscles. 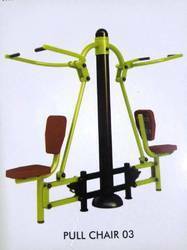 Use: Lying on the equipment, hooking the Horizontal‎ bar firmly with foot ( the horizontal bar can be top bar, middle bar or lower bar which determined by the user’s physical condition ), folding hands behind the head and trying best to sit up with the strength of abdominal muscles then lay down slowly, exercise in this way repeatedly. (i) ‘U’ main frame 80mm pipe ‘B’ class (2.5mm thickness). (ii) Bottom main frame 114mm pipe ‘B’ class (2.5mm thickness). (iii) Permanent lubricated sealed bearing of reputed brand . (iv) Handle 32mm ‘B’ class (2.5mm thickness). (v) Nuts & Bolts Galvanised. (vi) Nylon covers for covering the Nuts & Bolt. 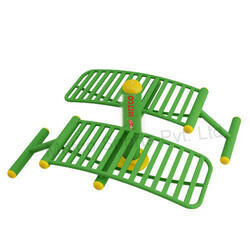 Pull Chair (Double)-03 Out of all the best equipments, Pull chair is widely used in for building up the strength of shoulder muscle group and upper limbs. 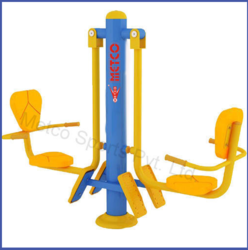 These fitness equipments are beneficial in improving the mobility, flexibility and coordination of ankle & shoulder joints. 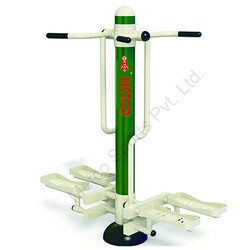 People with joint ache in limbs, functional disorder in bending and motion discomfort are advised to use this fitness equipment. (i) Central main pipe 114mm ‘B’ class (2.5mm thickness). (ii) Sitting pipe 40mm ‘B’ class (2.5mm thickness). 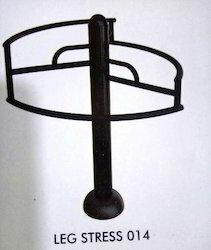 (iii) Both side vertical structure pipe 40mm. (iv) Seat metallic sheet 3mm M.S. 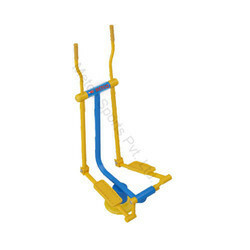 (v) Seat moving pipe 2”x2” square M.S. (vi) Upper Handle pipe 40mm. (viii) Permanent lubricated sealed bearing of reputed brand . (ix) Nuts & Bolts Galvanised. (x) Nylon covers for covering the Nuts & Bolt. 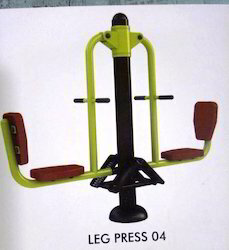 Leg Press (Double)-04 This leg Press is the most simple fitness equipment to work with. 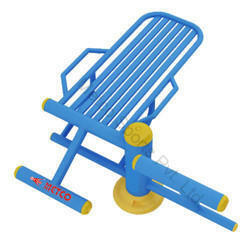 One just has to stretch his legs with force and recover them slowly sitting on this equipment and feet resting on the board. 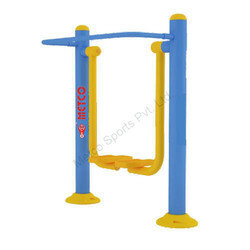 This fitness equipment works on the strength of lower limbs, helping in healing the hindrances felt while bending and stretching.Detail of pipe sizes:(i) Central main pipe 114mm ‘B’ class (2.5mm thickness). (ii) Sitting pipe 40mm ‘B’ class (2.5mm thickness). (iii) Both side vertical strecture pipe 40mm. (iv) Seat metallic sheet 3mm M.S. (v) Footrest M.S checked sheet 4mm thickness. (vi) Permanent lubricated sealed bearing of reputed brand . (vii) Nuts & Bolts Galvanised. (viii) Nylon covers for covering the Nuts & Bolt. 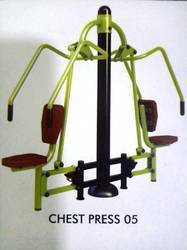 Chest Press (Double)- 05 Out all the best equipments, chest press is widely used in for building up the strength of chest muscles and ribs of upper limbs. 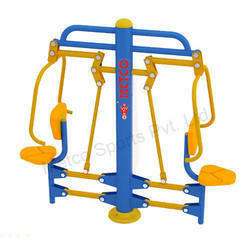 These fitness equipment are beneficial in improving the wideness of chest and ribs strength. 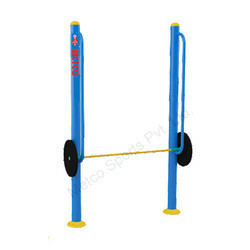 People with plain chest and limbs are adviced to use this fitness equipment.Detail of pipe sizes:(i) Central main pipe 114mm ‘B’ class (2.5mm thickness). (ii) Sitting pipe 40mm ‘B’ class (2.5mm thickness). 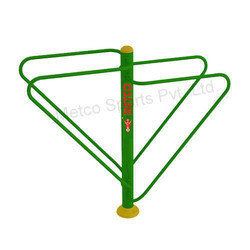 (iii) Both side vertical structure pipe 40mm. (iv) Seat metallic sheet 3mm M.S. 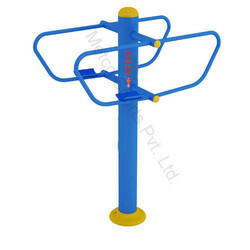 (v) Seat moving pipe 2”x2” square M.S. (vi) Upper Handle pipe 40mm. (vii) Grip Handle 25mm. (viii) Permanent lubricated sealed bearing of reputed brand. (ix) Nuts & Bolts Galvanised. (x) Nylon covers for covering the Nuts & Bolt. 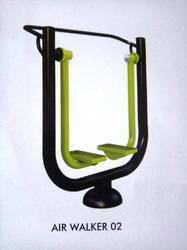 Elliptical Cross Trainer- 07 Among all other outdor fitness equipments, Elliptical Trainer gives people an excellent way of easy workout. 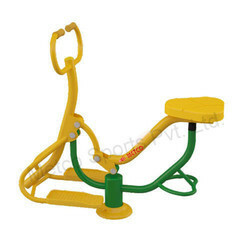 These equipments are designed for developing and strengthening the cardiac functions and whole body joints, at the end resulting in a perfect shaped figure. In this trainer.Detail of pipe sizes:(i) Main frame 80mm ‘B’ class (2.5mm thickness). (ii) Bottom main frame 114mm ‘B’ class (2.5mm thickness). (iii) Handles 40mm ‘B’ class (2.5mm thickness). (iv) Grips 32mm ‘B’ class (2.5mm thickness). (v) Footrest M.S checked plate 4mm thickness. (vi) Movement pipe 2” square M.S(vii)) Permanent lubricated sealed bearing of reputed brand . (viii) Nuts & Bolts Galvanised. (ix) Nylon covers for covering the Nuts & Bolt. 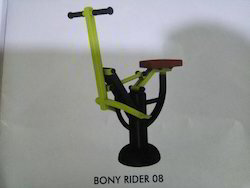 Bony Rider/ Horse -08 Bony Rider is not only increases the strength of hand/arms but also the legs / feets. 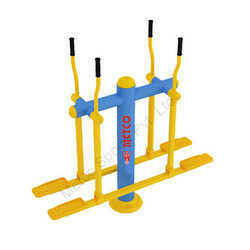 It is a unique combination for improving the balance between the upper and lower body part. This is also very useful for stretching the back from front to lower bottom. This is very usefull for maintaining the balance in between the backake and front chest stretching.Detail of pipe sizes:(i) Main frame 80mm ‘B’ class (2.5mm thickness). (ii) Back round support 50mm ‘B’ class (2.5mm thickness). 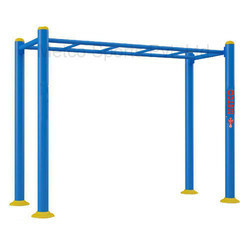 (iii) Front round support 50mm ‘B’ class (2.5mm thickness). (iv) Moving seats 50mm squar M.S ‘B’ class (2.5mm thickness). 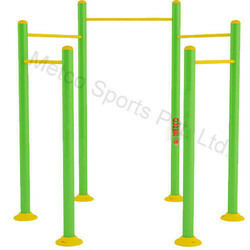 (v) Front vertical pipe 50mm square M.S ‘B’ class (2.5mm thickness). 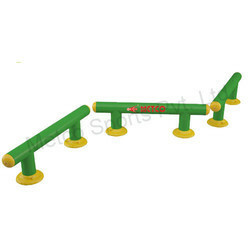 (vi) Handles 40mm ‘B’ class (2.5mm thickness). (vii) Permanent lubricated sealed bearing of reputed brand. (viii) Nuts & Bolts Galvanised. (ix) Nylon covers for covering the Nuts & Bolt. (iii) Bottom main pipe 114mm. (v) Footrest M.S checked plate 4mm thickness. (vii) Nuts & Bolts Galvanised. (viii) Nylon covers for covering the Nuts & Bolt. 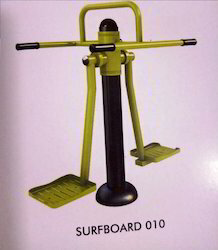 Surf Board (Double) -010 Surf Board is unique exercise for increasing the flexibility of legs from left end to right and again from right to left end. 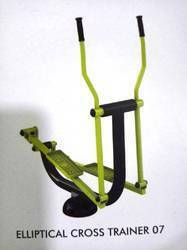 This not only increasing the flexibility but also helps to maintain the lean and thin sides waist of body. 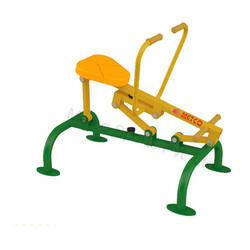 It also increasing the strength of lower and middle waist muscels. 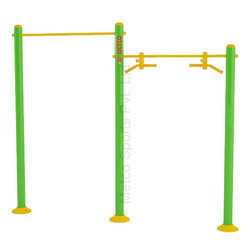 It also helps in maintaining the proper balance of body.Detail of pipe sizes:(i) Central main pipe 114mm ‘B’ class (2.5mm thickness)(ii) Side rohund pipes 50mm ‘B’ class (2.5mm thickness)(iii) Handles top support 40mm ‘B’ class (2.5mm thickness). (iv) Footrest M.S checked plate 4mm thickness. (v) Permanent lubricated sealed bearing of reputed brand . (vi) Nuts & Bolts Galvanised. (vii) Nylon covers for covering the Nuts & Bolt. 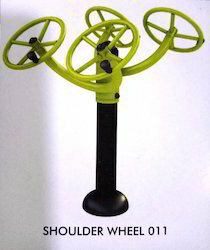 Shoulder Wheel -011 Shoulder wheel is most effective for arm and maintaining the flexibility of hand, arm and Shoulder movements. 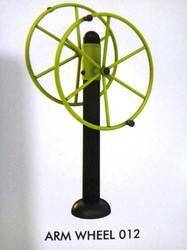 It rotates both side clockwise as well as anti clockwise. 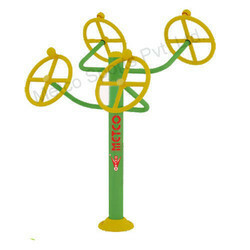 It also helps in increasing the visiblity of eye movements while rotating and maintaining the peace of mind. Over all it’s a unique exercise for hands, arms, soulder, eye rotation and mind consideration.Detail of pipe sizes:(i) Central main pipe 114mm ‘B’ class (2.5mm thickness)(ii) Both side arm support 40mm ‘B’ class (2.5mm thickness)(iii) Rotating wheels 30mm ‘B’ class (2.5mm thickness)(iv) Permanent lubricated sealed bearing of reputed brand . (v) Nuts & Bolts Galvanised. (vi) Nylon covers for covering the Nuts & Bolt. Arm Wheel 012 Arm wheel is most effective arm stretching exercise. 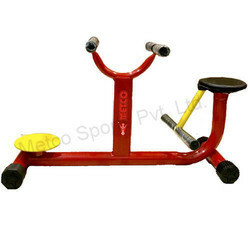 It increasing the flexibility of upper part of body from top to bottom. 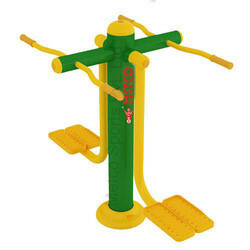 It not only stretch the arm but also helps in maintaining the mobility of each and every bone joints of hands, arm and soulder. 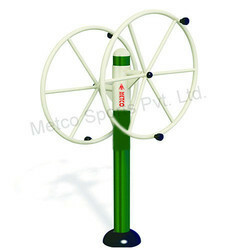 It also helps in circular eye movement while oprating continuously. 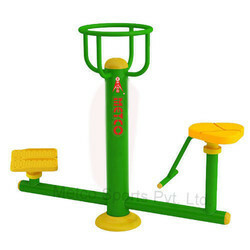 It also helps in maintaining the mental balance between the body movements and thought. It gives the positive mental feeling while using continuously. It a practical eye and mental balance exercise. It’s a unique combination of physical and mental human functional.Detail of pipe sizes:(i) Central main pipe 114mm ‘B’ class (2.5mm thickness)(ii) Both side arm support 40mm ‘B’ class (2.5mm thickness)(iii) Both side Rotating wheels 30mm ‘B’ class (2.5mm thickness)(iv) Both side central wheel supporting pipes 25mm ‘B’ class (2.5mm thickness)(v) Permanent lubricated sealed bearing of reputed brand . (vi) Nuts & Bolts Galvanised. (vii) Nylon covers for covering the Nuts & Bolt. 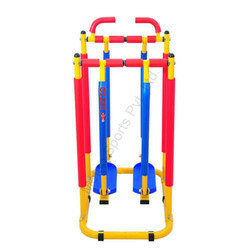 Cross Walker Function：Srengthen the heart and lung respiratory function by the continuous swing of arms and legs. Delivery Time: 5 to 7 Working Days.